LONG ISLAND CITY, NY – From a business standpoint, the Weickert family has been through every major economic downturn in American history. But a long history in the sheet metal industry has kept the family and their determination afloat for nearly a century. Hans Weickert opened his specialty copper roofing and tinning company in 1923. By the time the Depression and World War II took their toll, the company folded, but Weickert took the misfortune and opened Craft Sheet Metal with a partner in 1946. 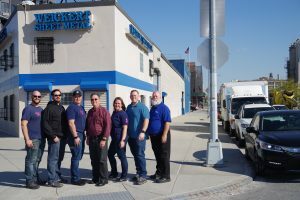 Three generations worked at Craft Sheet Metal, including brothers John and Tom Weickert, who left to open Weickert Sheet Metal (now Weickert Industries) in Long Island City, New York in 1982. Their children – Lisa, Tom, Chris, Stephen and John Weikert III – grew up in the shop, sweeping, cleaning and doing menial labor during the summers. 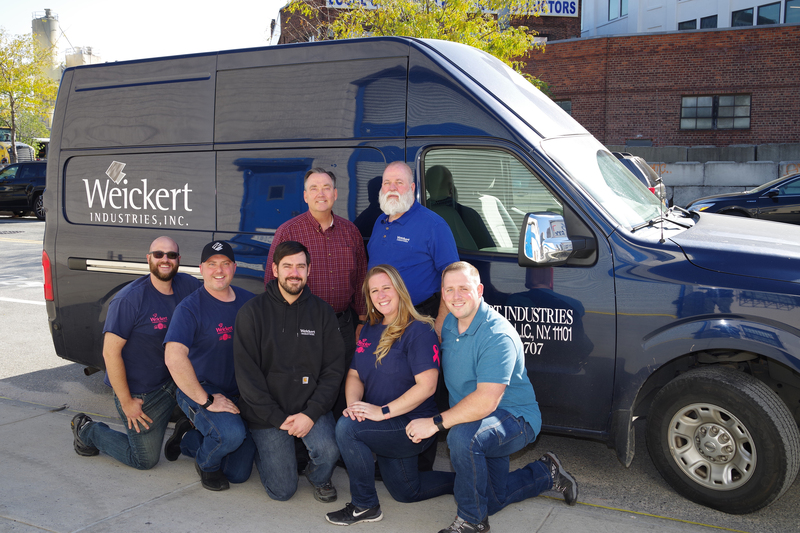 That bond built the team that operates Weickert Industries today. With John and Tom Weickert at the helm, their children run the day-to-day operations, including on-the-job functions such as installation, measuring, fire life safety and testing, adjusting and balancing (TAB), which is the balancing of air to make buildings comfortable and safe. Lisa Weickert, the only female out of the five cousins and the first female hired by the company, is a former nanny and kindergarten teacher. Although she knew a lot about the company, including the work performed, she wanted to learn every aspect. She has completed courses and certifications through the International Certification Board (ICB) as well as attends the annual ICB/TABB (Testing, Adjusting and Balancing Bureau) Conference and learns as much from her family as possible. The five cousins adopted a lean construction management style, developing processes and systems for all parts of Weickert Industries. Together, they divide and conquer, focusing on their goals while maintaining efficiency and working to promote air balancing in the sheet metal industry. Their management style is largely based on trust, which also was forged in those summers in the shop. “Working with family is extremely difficult. We make it look easy,” said Stephen Weickert, with a laugh. The Weickerts, as well as many other signatory contractors with SMART, the International Association of Sheet Metal Air, Rail and Transportation Workers (formerly the Sheet Metal Workers’ International Association), rely on certifications from ICB/TABB (International Certification Board/Testing, Adjusting and Balancing Bureau) as a statement the technician, supervisor and contractor demonstrate the highest level of professional expertise. ICB/TABB is the first program to gain ANSI (American National Standards Institute) accreditation for certification in the testing, adjusting and balancing industry. Those certifications are supported by the National Energy Management Committee (NEMIC), a not-for-profit organization jointly funded by the Sheet Metal and Air Conditioning Contractors’ National Association (SMACNA) and SMART. NEMIC identifies opportunities, seeking to create or expand employment for SMART members and programs that assist SMACNA contractors. For additional information on ICB/TABB, visit the website at www.icbcertified.org.